Rock Paper Lizard: My blood runs cold. Google Street View has recently become available for large Canadian cities. 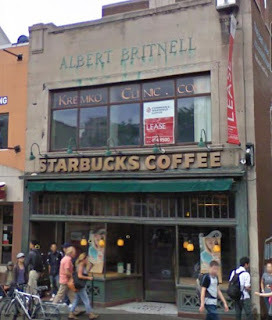 I decided to walk around downtown Toronto, where I lived for several years while in graduate school. I checked out some of our old haunts, notably the pubs and bookstores we favoured back then. In Google Street View, I am a cranky, restless ghost. I feel your frustration and anguish; there's nothing like a good bookstore. You can get coffee anywhere, but independent bookstores are a rarity. A pity. Speaking as a resident of evil Charbucks' hometown, I share your pain. Also, Google streetview creeps the HELL out of me! If you see a Prius cruising past your house with a camera sticking out, feel free to make a rude gesture to be preserved for posterity!